The Scarab virus is a ransomware that uses the AES cipher to encrypt valuable system and user files. Its encryption engine marks the affected files with the .scarab extension and extorts the victims to pay a fee. Users can restore their computers and recover the files by following the instructions in our removal guide. How Does Scarab Virus Infiltrate the System? The Scarab virus is distributed in a single binary executable file that can be spread using different methods depending on the targets and the required scale. One of the primary infection strategies employed by most ransomware like this one is the coordination of spam email messages. They use social engineering strategies that make the users infect themselves. The emails are made to appear as legitimate companies or government institutions and usually carry the virus as either attached or linked in the body contents. Office documents and modified software installers can also carry the Scarab virus code. They are spread on hacked or hacker-controlled download sites and popular P2P networks like BitTorrent. The hackers can also create web redirects and ad networks that redirect to them. Browser hijackers and other malicious add-ons can deliver the Scarab virus as part of their infection behavior. The security community is continuously monitoring the infection attacks carrying the .scarab virus. According to the latest reports a new global attack campaign has been initiated by computer criminals using this particular malware. The distribution strategy relies on e-mail messages that use typical blackmail strategies that seek to manipulate the victims into opening up attached files. It appears that the Necurs botnet is used to spread the majority of the .scarab virus strains. Modified Software Installers ‒ Executable files can be used to institute the .scarab virus on the target systems. They are usually disguised as software installer for popular free or trial versions of famous software. Document Payloads ‒ The hackers can bundle the .scarab virus threat in documents of all types including rich text documents, spreadsheets, presentations and databases. Once they are opeend a prompt notification is shown to the victims which asks them to enable the built-in scripts (macros). Once this is done the .scarab virus infection is place onto the target systems. Security researchers identified a new ransomware threat called the Scarab virus made by an unknown hacker or criminal collective. The initial analysis does not show any similarity between the code and any of the famous malware families. Upon infection with it the encryption engine is automatically started. It uses the AES cipher to target a predefned list of target file type extensions. They can be customized according to the targets or individual networks. Similar malware like the Scarab virus usually attempt to process as many different files as possible: documents, archives, databases, backups, configuration files, music, photos, videos and etc. Furthermore some of the Scarab Ransomware samples show rename the files using a Base64 algorithm to make recovery more dificult. The total size of files must be less than 5Mb (non archived), and files should not contain valuable information (databases, backups, large excel sheets, etc.). The infection is made to appear as a security precaution. This social engineering trick may be used to fool beginner computer users. The payment needs to be done using the Bitcoin digital currency. All transactions made through this system are anonymous and cannot be traced. An exact sum is not specified. The hackers negotiate the price based on the victims data and responsiveness. The criminals behind the Scarab virus offer a free decryption option to win the victims trust. A contact email is provided that is hosted using a free email hosting solution. Concerned users and victims can contact the hackers using this method as no payment gateway or specialized site has been made at this point. We expect to see updated versions that include additional modules and features as well as any further hacker attacks if the initial wave proves to be succesful. WARNING! 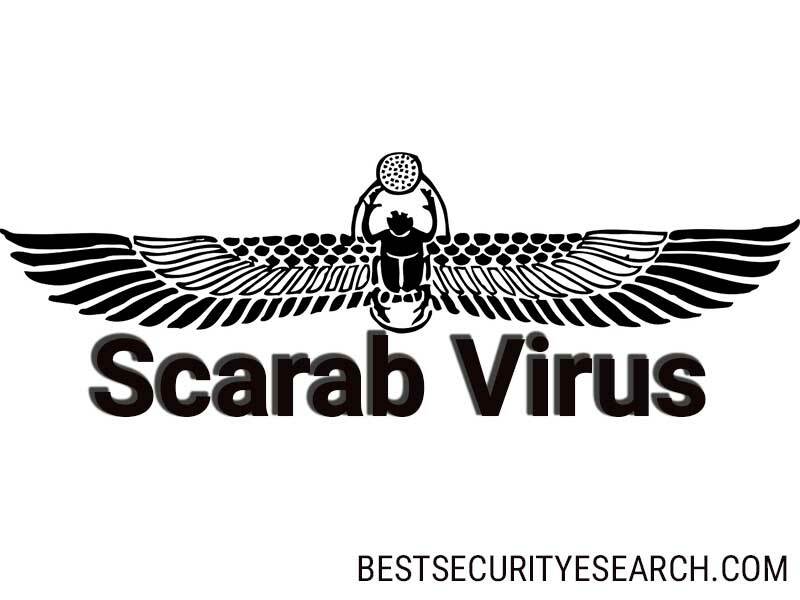 Manual removal of Scarab Virus requires being familiar with system files and registries. Removing important data accidentally can lead to permanent system damage. If you don’t feel comfortable with manual instructions, download a powerful anti-malware tool that will scan your system for malware and clean it safely for you. WARNING! All files and objects associated with Scarab Virus should be removed from the infected PC before any data recovery attempts. Otherwise the virus may encrypt restored files. Furthermore, a backup of all encrypted files stored on external media is highly recommendable.